Dieter Bierbrauer as John Wilkes Booth in Theater Latté Da’s production of the Sondheim musical Assassins. Photo by Dan Norman. 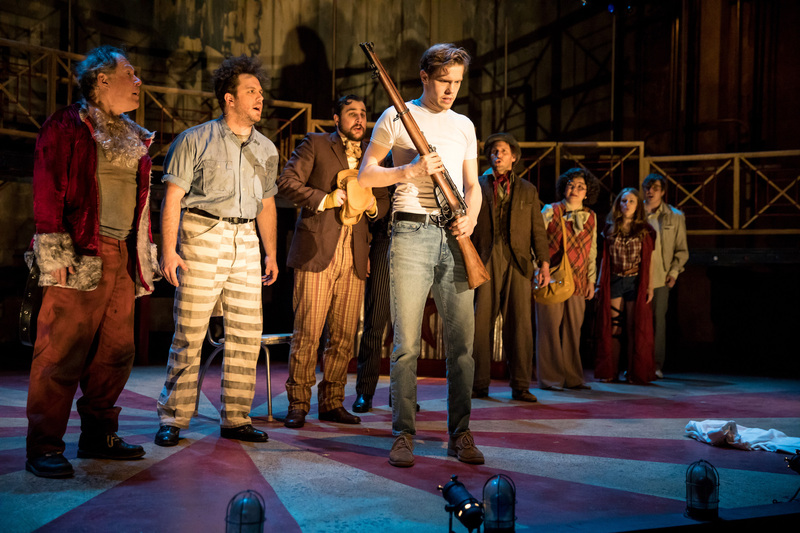 This Stephen Sondheim/John Weidman musical tells the stories of 8 would-be assassins with their sights set on the President of the United States, some succeeding and others failing. Assassins originally premiered off-Broadway in 1990 and didn’t on Broadway until 2004, when it belatedly won four Tony Awards, including Best Revival of a Musical. Sondheim’s carnivalesque music and biting lyrics permeate the show. Director Peter Rothstein and musical director Jason Hansen depict these isolated acts of violence as an engrossing, vaudeville-style alternate universe of mayhem. 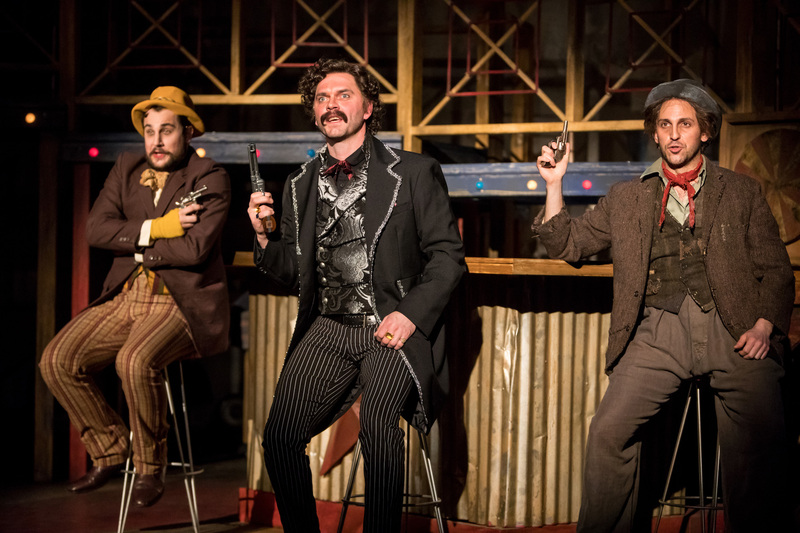 Benjamin Dutcher (Guiteau), Dieter Bierbrauer (Booth), and Rodolfo Nieto (Czolcosz) play a trio of successful and would-be assassins. Photo by Dan Norman. The show opens to a carnival shooting gallery. The Proprietor (Matt Riehle) of the establishment rounds up likely assassins and, in carnival barker fashion, offers each a gun with the incentive that killing a President will take care of all their problems. Enter the narrating balladeer, played by Tyler Michaels (also cast as JFK assassin Lee Harvey Oswald), who sings a ballad about John Wilkes Booth. Dieter Bierbrauer plays an exceptionally charismatic Booth – the first of a long line of assassins (although not all of them succeed), and one who spells out his motivations in a righteous manifesto. In some respects, this show is a history lesson – it runs through the assassins in chronological order, except for Lee Harvey Oswald, who does not appear until the end. The audience is assisted by program notes that provide a short biography of each assassin, a helpful resource on the lesser-known/would-be killers. Dieter Bierbrauer gives a dominating, menacing portrayal of John Booth, the actor who infamously shot President Lincoln at Ford’s Theatre while the dust of the Civil War was just starting to settle. Other assassins who appear include Charles Guiteau (Benjamin Dutcher), who shot President Garfield; Leon Czolgosz (Rodolfo Nieto), who shot President McKinley; Giuseppe Zangara (Eric Morris), who tried to kill Franklin Delano Roosevelt; Samuel Byck (James Detmar), who tried to kill Nixon with a plane; and the infamous Oswald (Tyler Michaels). The assassins’ motivations are diverse and spooled out in a set of fascinating performances. Czolgosz, a former steelworker, conceived himself as a victim of the capitalist exploitation of the masses; inspired by anarchistic dogma, he decides to kill McKinley. Giuseppe Zangara was delusional and clearly mentally ill, with a devil-may-care attitude to collateral damage. Samuel Byck, a Willy Loman-type assassin, died in a plane hijacking that now unsettlingly presages the September 11 attacks. Michaels’ portrayal of the enigmatic Oswald captures the character’s relative mystery, which has fueled countless conspiracy theories. Much needed humor can be found in the interplay between Sara Ochs and Shinah Brashears as Sara Jane Moore and Lynette “Squeaky” Fromme, when they discuss their nonsensical reasons for their attempt on President Ford. Brashears takes her “my husband (Charles Manson) is Jesus routine” to a new level when she taunts Evan Tyler Wilson, who portrays John Hinckley as a nerdy killer wannabe who shoots President Reagan to impress his “girlfriend” Jodie Foster. Lee Harvey Oswald (Tyler Michaels, center) prepares to walk down the path of the lone gunman. Photo by Dan Norman. Music director/conductor Jason Hanson keeps Sondheim’s melodic music centered with all of the action. Eli Sherlock’s carnival set design is a perfect pairing with the music, contributing to the thrill atmosphere most notable when the assassin Guiteau is chased up and down the catwalk. The entire experience is heightened by Eli Sherlock’s lighting design and C. Andrew Mayer’s sound design. The result is an astounding musical that comes as close to an immersive experience that I have seen in theatre. Assassins plays through March 18 at the Ritz Theater Mainstage in Northeast Minneapolis.